The Intercultural Studies will strongly support the life and research of students on campus. 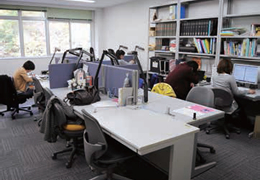 There are research rooms prepared here especially for students, and each room contains a desk, locker and bookcase. Additionally, many rooms contain computers, allowing free use of email and the Internet. This system is designed for students who cannot complete their degree within two years for any reason. They may apply to take over two years for their degree when enrolling and if the university accepts this, they can stay for over two years for the same tuition fee as that for two years. The yearly tuition fee will be the total fee of two years, reduced by the number of years that they have been admitted as a long-term student. However, if the fees are revised during this time, the new fee will immediately be applied. The following reasons are valid reasons for application. 1: Already employed (including temporary work or self-employment), not counting sporadic part-time work. 2: Housework, raising children, providing care or other such reasons. 3: Any other reasons the head of the department deems appropriate. Even if you fit the above criteria, provision by the system is not guaranteed, so please discuss the matter with the appropriate contacts before applying. We wish you will live a free and fulfilling campus life at this university. It is important to establish mutually respectful relations regardless of age or gender. However, the more people you associate with, the greater the chance becomes of hearing something unpleasant, or one side hurting another without meaning to. Harassment means threatening or offensive behavior and refers to using a superior position in work or school to inflict mental or physical harm through actions and speech that another finds unpleasant. There are many different types of harassment, such as sexual harassment and academic harassment. The Intercultural Studies has a harassment prevention committee formed from both male and female teachers. If you are unlucky enough to encounter any kind of harassment, don’t keep it to yourself, but quickly consult one of the teachers on the committee. If you don’t want to go alone, ask someone else to come with you. We also respond to anonymous requests for advice. The committee takes care to preserve the privacy of those who seek its help, so there is no need to worry about consulting us. A fixed number of copy cards are freely distributed each year, so that you can copy any resumes or materials that you require for your classes or research.